When it comes to books, I am a shallow person. I am swayed by titles, covers and blurbs. 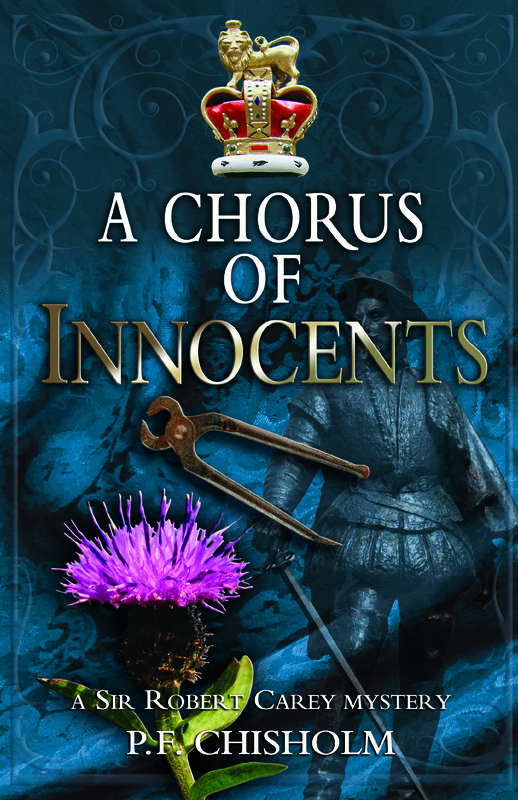 A Chorus of Innocents has a nice thistle on the cover, a good collective noun in the title and the blurb promised me an Elizabethan mystery: sold! Only when I started reading all the preamble to my Kindle review copy (why do covers matter when you read on a Kindle?) did I realise that A Chorus of Innocents is the seventh in a series featuring the real life Sir Robert Carey and a collection of real and imagined cohorts. Foolish and a little apprehensive is how I felt. Would number seven in the series leave me feeling like I’d joined the party too late? Action kicks off in October 1592 (a mere 10 days after the last book finished) when a pregnant woman bursts into Lady Widdrington’s house having been raped and having witnessed the murder of her husband. Lady W loses no time riding into the Scottish Border lands to find out what happened. We are in a world of clans and reivers, men who will steal anything that is not nailed down for which the only punishment is seeing your goods stolen back, provided what you steal is not the property of either important people or your own family. The murdered man had been a reiver but had somewhat unusually become a clergy man. James VI of Scotland and his favourite Lord Spynie make an appearance. Everybody seems to think that the mysterious tooth drawer is in fact a Jesuit spy. We meet monks eking out a living in amidst the ruins of their monastery. Robert Carey flits around on the edges of the story only coming to the fore at the end. A Chorus of Innocents is an excellent romp, although Robert Carey is a distant figure in the book despite being its hero. Some elements of the story seemed to just hang and have no resolution, doubtless volume 8 will reveal all. From my read of this book, if you are a fan of semi biographical historical murder mysteries with an Elizabethan setting then look no further than the Sir Robert Carey mysteries.